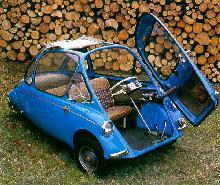 The Heinkel aircraft company from Stuttgart, Germany launched its first passenger car in 1955, the Cabin Cruiser. 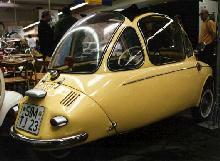 The small Heinkel was one of the highly successful and popular "Bubble Car" micro-cars that became all the rage in Europe during the 50's-60's. Heinkel was sold to Dundalk Engineering and was built in England by Trojan. These later cars were sold as the Trojan 200 until 1965.